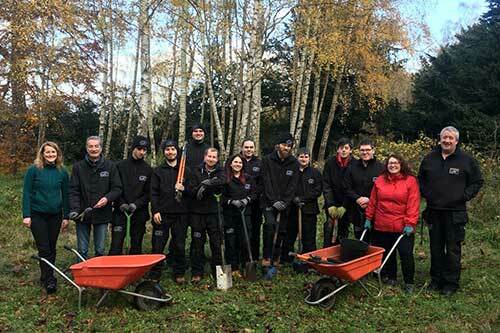 Danielle Rowley MP joined Rural Skills students from Newbattle Abbey College to plant trees as part of the Queen’s Commonwealth Canopy, a network of forest conservation initiatives in association with the Woodland Trust. The trees. two silver birch, two rowan, and a hazel were planted in Lord Ancrum’s Wood next to the College on Thursday 9th November 2018. They were donated to Ms Rowley thanks to a partnership between the Woodland Trust, Sainsbury’s and ITV.